In Ilulissat the big icebergs frequently get stuck on a reef at the exit from the fjord and it takes them weeks or longer to free themselves...so we should have plenty of time to admire them in the webcam. ...if I had the time I'd keep tracking the big ones with S-1 as post results here.. The Arctic Hotel Webcam is pretty bad located when you want to observe the mouth of the Fjord, wonder why no one placed a web cam in a better position? I wish a webcam would be placed on the rock cliff south of the south branch, where "Chasing Ice" was filmed from. But it looks like the image has been stuck for some days now. Any way of telling how thick they are from the freeboard ? Yes by measuring the shadow...requires calculating the elevation-angle of the Sun at the time of the acquisition. I did some measurements and currently the southern branch and it's tabular icebergs have 68.8m freeboard. For comparison during the record low in August 2015 the freeboard was 125m. Not that there's that much to see but Hotel Ilulissat webcam is up. currently the southern branch and it's tabular icebergs have 68.8m freeboard. For comparison during the record low in August 2015 the freeboard was 125m. Now that is a difference. How come? I guess the calving was further back in 2015 - is that the "record low"? I'm guessing but the big bergs come from the deeper cuts in the fjord, their release indicates bottom melt/seawater penetration. It may be the case that they can only move towards the calving front down the deepest channel, and that they are forced to the south of that channel by the two ice streams falling into the northern side of the southern branch. Those two ice streams are indicated by the overturning features on that flank. Just as they get stranded on the cills down the fjord they are held up until they can pass over the threshold of the deep channel. This is a detail from the 3rd showing the bulge on the front where the big bergs hold things up [? ], and the two overturning ice streams falling into the fjord, the second being +/- an order of magnitude smaller. This has the glacier top but shows the melt ponds and movement to the south. Keeping an eye on this large square berg which has been at the mouth of the fjord for ages. One of the tabular bergs which has not yet flipped is about to impact it. Will the tabular berg flip? Will the square mass finally get carried out to sea? Would be cool to see real time. To my surprise the calving/retreat continues, the surface in the bay is at @ 6c , there's clearly a build-up of ice at the outer cill but given the huge open area of the fjords the tidal movement is causing enough bottom melt to keep some ice moving away. The southern branch has retreated behind the cill by this winters terminus so we may see a rapid retreat to the next cill where I assume there are more giant bergs to impede further rapid loss. We'll see.. Thanks Espen. Interesting. Looks like there was a strong flushing of the fjord. The main branch calves faster than it advances with more ice dropping into the fjord from it's north side. The west face of the northern branch appears to be discharging more water than ice, and the north-west ice stream continues to calve. I'm beggining to wonder if a record retreat is possible, I guess it's more to do with how much the fjord can clear out than the potential mobility of the glacier. It's the new moon today so this tidal cycle has yet to run. What I find strange - after several years of continuous retreat, JH more or less stopped calving and had a strong advance through the last year, and sufdenly it all calves away. It could be random of course, but I still wonder if there was some new physical process at work. I wonder if anything changed in the glacier's speed of advance or its height. If anybody has aceess to such resources with current data, please do post them here. I seem to remember there was one academic project of automatic tracking of GIS glacier speeds, but can't remember more details. 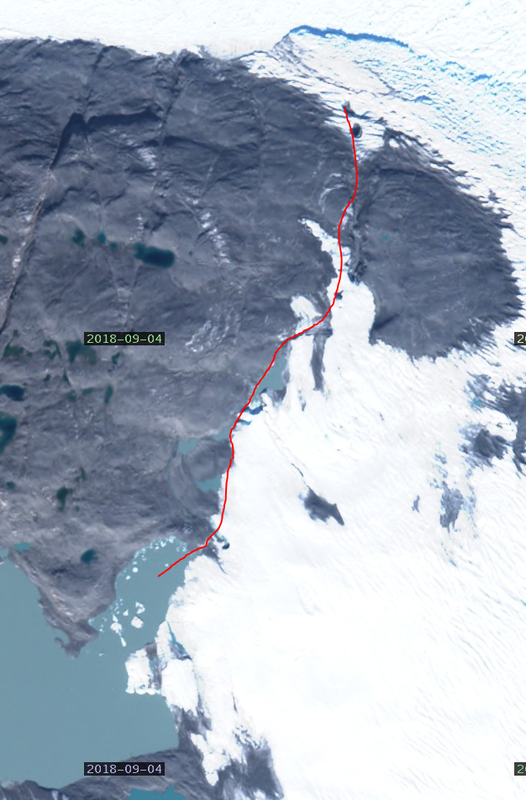 I suspect that IceBridge has interesting details of the height of the glacier - but we will have to wait for an official learned paper (if Potus allows such "fake" publications?)? No sign of a blockage anywhere but the outer cill, what happens when that gives? I've been reveiwing the thread for better insight, the following image from Espen is interesting. It suggests that all the giant bergs with keel shaped undersides that have calved since 2013 have come from further upstream than the first deep trough. I don't think I have the skill to work out how many kilometers of glacier have calved since then, but knowing that would give some indication of how fast we can expect it to move in the future. Ball park though is that 5 times the distance from that calving front to the split has been lost. Interesting feature ene of the calving front, with a large meltpond just a little further out. Looks like 79N is primed for action too. "Our approach could be expanded to the simulation of fast-flowing ice streams, to capture the manifold observed mechanical decoupling from the side margins and hence a possibly stronger response of the plug-like flow to perturbations"
Apparently and logically more cracks = less friction = faster flow. The evolution of the crack field and the exposure of more of it through melt has been one of the more fascinating things to watch over the years. There's another extremely ominous looking crack also. yesterday there was an image where it looked possible that a dam was forming no sign in that powerful flow. It looked like the cill at Disko was stopping flow, but even after the tides peaked it's broken free and looks to have set everything in motion again. Do the meltwater streams hitting the ice stream from the side have any real effect on the rate of ice export through Jakobshavn Isbræ? There seem to be some clearer areas where larger streams join in. And it looks like a new stream might be forming close to the calving front too. Thx Nukefix, Mr. A. Insignificant in my [amateur] opinion, without the tides forcing water into the fjord twice a day my guess is that the fjord would freeze up. It takes the full/new moon tides to break the jams both in the fjord and at the outer cill. So an image from the 9th ,new moon, showing breakout from the outer cill some of the seasons tabular bergs are still held up. All the ice edge appears to be calving competing for space with the main thrust from the southern branch for space, the fjord is ram full but still mobile. Nice example of iceberg collapse at the mouth of the Ilulissat icefjord. 3MB animated GIF attached. The collapse at the outer cill has been followed by a slow but continuous clearout, so far no sign of any concentration/blockage on the inner cills. It'll be interesting to see how close the retreat gets to the calving fronts. Looks like an outburst from the southern front, let's hope the cloud clears. Thanks for that information. Do you have a guess how many km² were lost in that last calving? And, second question: I heard that Jakobshavn Isbræ ice flow has sped up remarkably in the late 1990s and in the 2000s. Has it been stable since then or is the ice speed still increasing? Stephan your guess is as good as mine, sentinel image from 11nth. my wonder on this is the amount of water breaking out, it's pushed the ice what 3k+ at 3k+ wide thats somewhere between 5 and 9km3. I think. wonderfully clear view from sentinel [0.4/1.7] meanwhile despite the extensive calving including some very large icebergs the retreat in the fjord continues. polarveiw and the full moon tomorrow so more big tides in prospect. A close look at the leading edge reveals a surge of several tens of meters across the entire calving front between sentinel images on the 17th and 22nd. The last calving event appears to have allowed the main stream to move more freely. Actually this could be due to the normal speed of the glacier. Its fastest measured speed was 46 m/day (!) in summer 2012, I don't know what the speed is now but surely it's >10 m/day. Couple of details from polarveiw. the calvings are beginning to look pulsed maybe tidal? further inland the circular feature mentioned above continues to slowly evolve, it may be wishful thinking/confirmation bias/processing artifact but to me it looks like the ice is slumping both around/into and out of this feature, I used the low res I'll put the links to higher below. Here's John's knob from sentinel. 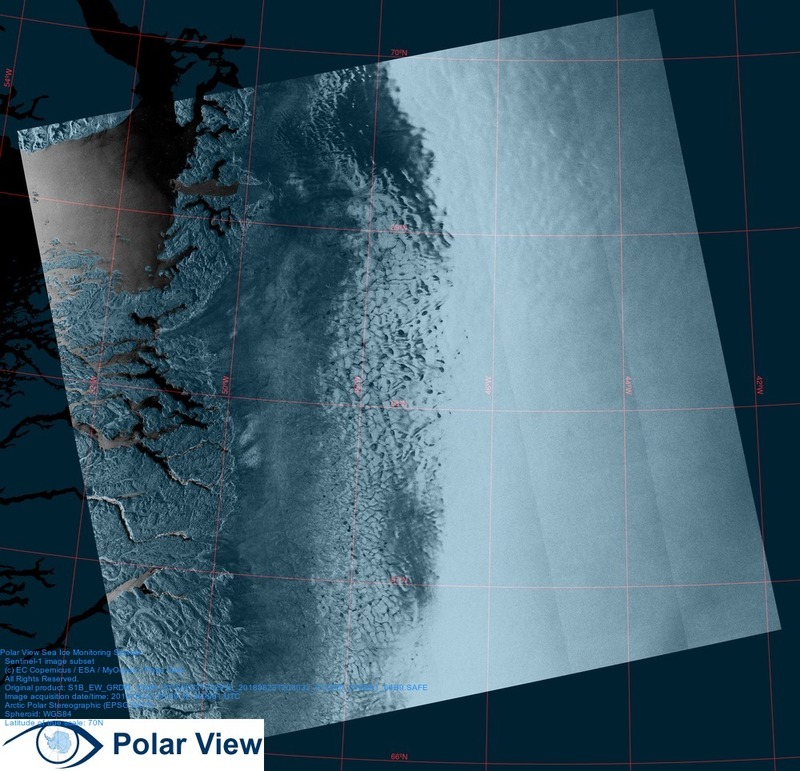 Tabular Icebergs reappear like we saw last season (2018) and for the first time in many years, is this a new norm, and what is the reason for it? Espen thanks for the animation, the reason? I've been thinking about this lately and my guess is that the the whole of the deep channel to A30 and possibly A45 has been cleared of 'keel' shaped bergs which were grounded in the base of the channel. Tidal surges force seawater into the depths and these have penetrated as far as the feature mentioned above. The ice above, at A45 is about 1000m deep so inevitably the basal ice remains in contact with the landscape and is ground as it's forced down the fjord. The base of the channel widens past A30 and perhaps the basal bergs from here get stuck as the channel narrows, I'm not certain that would even show up as a surface feature. Just a follow up, it looks like the glacier was grounded until about 1996-2002 at about A0. So possibly a shear zone existed above the 'keel' formed bergs of the deep channel. Some time after that, once the tidal surges passed the cill[A0] the bottom melt began to loosen the giants which subsequently blocked the flow once they reached the cills, and then at various points on their way out to the cill at the entrance. Once the seawater passes the cill just inland from A0 it begins to melt the basal ice, and at those pressures forces its way into every flaw and always further inland. I guess in about 5 years we may see a pronounced tidal regime with the deep channels full of the most dense broken ice lubricating the flow.